Photo by Bob Thomas, Chiquibul National Forest, Cayo District, Belize, March 2005. 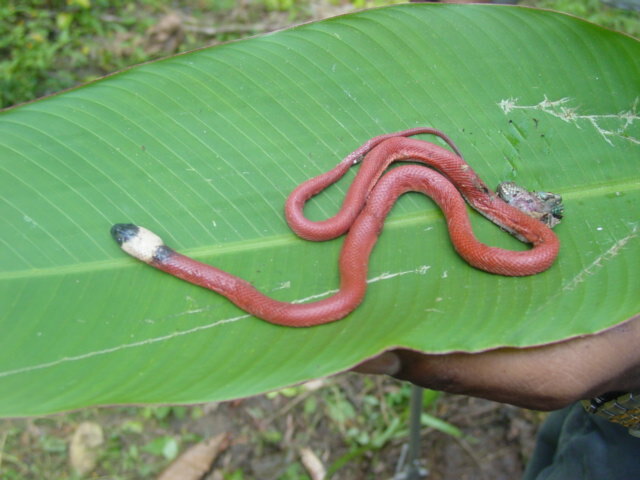 This juvenile mussurana was found along a trail deep in the Chiquibul National Forest. Someone had been chopping on a felled tree and they chopped the snake. A lizard is protruding from the wound. Adult mussurana’s are generally black. They eat other snakes and, like other non-threatening snakes, should be left alone.